and the mother of safety. to be feared as fear. till that other is ready. we may go from it. Chimo! ** Welcome to the Web portal of Michael Neiger's Michigan Backcountry Search and Rescue (MibSAR), a small, largely non-motorized, Long-Range Special Operations Group (LRSOG) organized as a Community Emergency Response Team (CERT) under the auspices of the U.S. Department of Homeland Security (DHS) and the Michigan Department of State Police (MSP). a circular movement of the left hand over one's heart. ...should not interrupt those who are doing it. 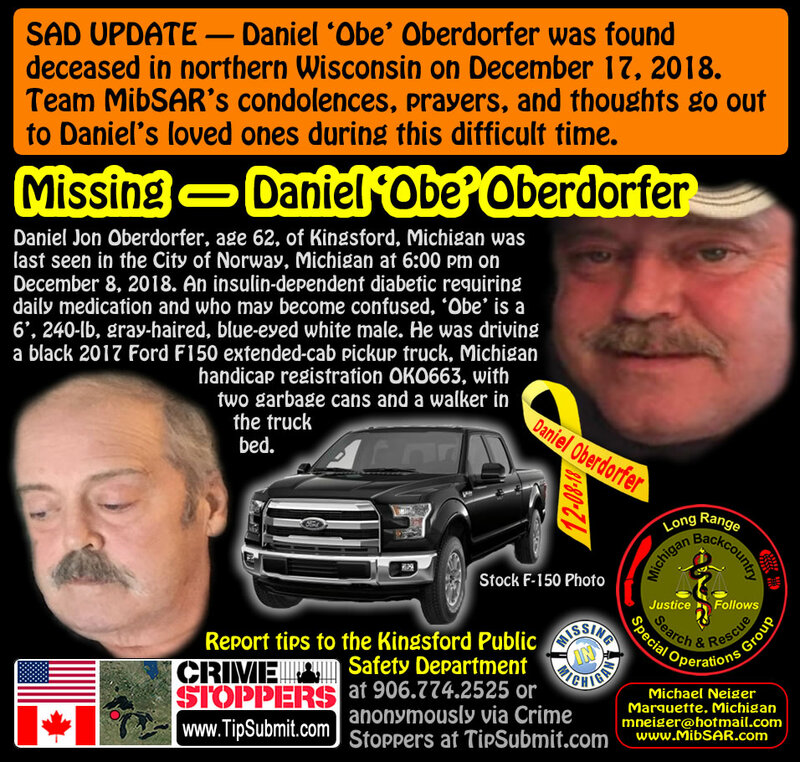 Founded and run by Michael Neiger, an independent investigator in Marquette, Michigan, MibSAR's Long-Range Special Operations Group (LRSOG) is dedicated to working select unsolved missing-person cases and felony cold cases in the remote bush between the Great Lakes in northern Michigan, USA, and the Arctic Ocean’s Lower Hudson Bay in Ontario, Canada. Important Notice: While Michael Neiger's special operations group (SOG) collaborates with law enforcement agencies, search-and-rescue teams, task forces, and strike teams regarding on-going investigations and operations, his special operations group (SOG) is not a traditional, paid, professional, "first-response," search-and-rescue unit. ...so loved ones aren't left behind. 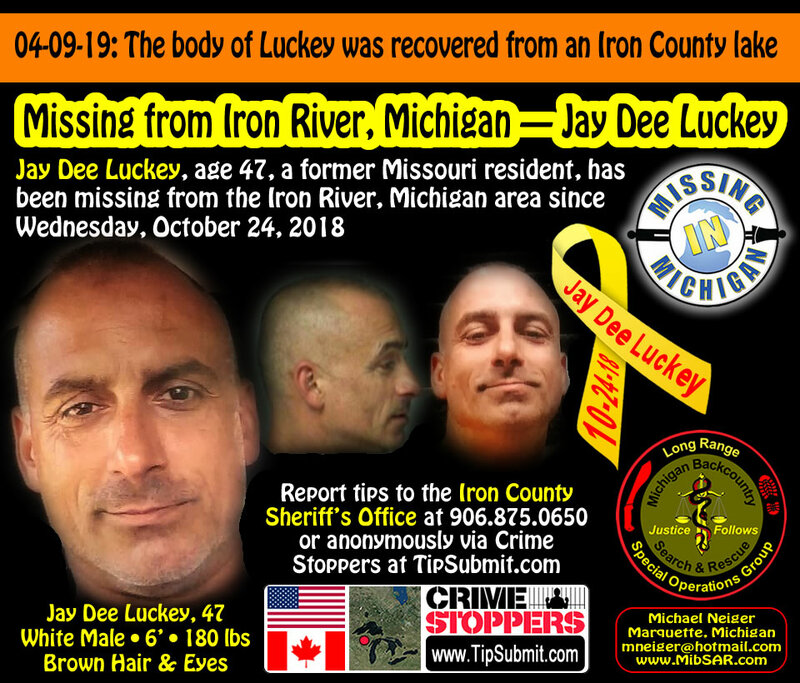 His SOG is one of 'last resort' that specializes in working on select missing-person and felony investigations, primarily ones that have been suspended by the agency of jurisdiction. 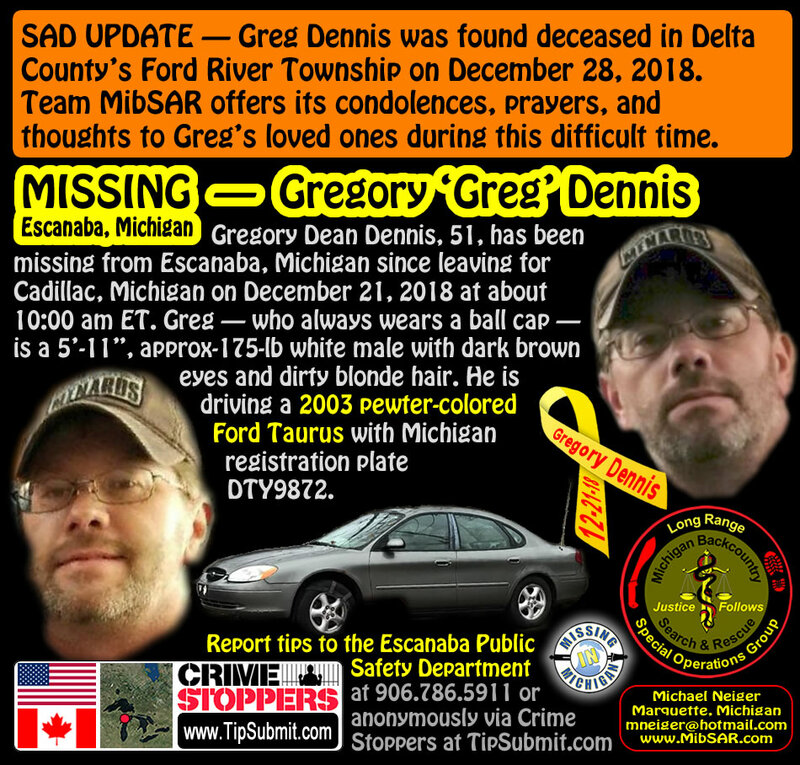 An incident requiring an emergency search and rescue (SAR) response should be immediately referred to the agency with jurisdiction over the area where the incident occurred—often a sheriffs department in Michigan; or the Ontario Provincial Police (OPP) in Ontario, Canada—by calling 911 immediately. On certain, select cases, Michael Neiger also designs, maintains, and hosts investigative Web sites; designs, prints, and distributes investigative posters; underwrites monetary rewards; and arranges for anonymous, toll-free tip lines and online tip-reporting programs through Crime Stoppers. 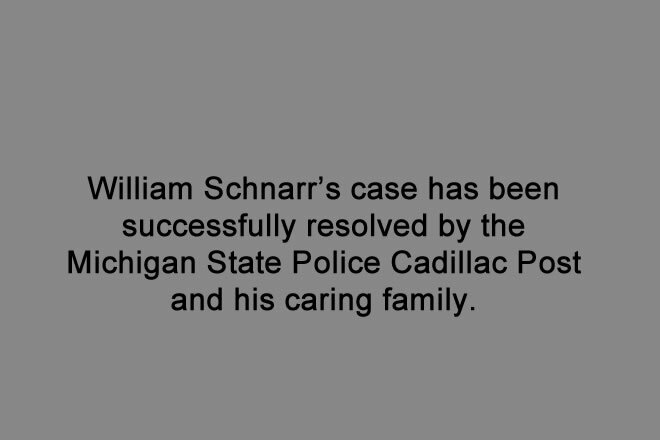 All of Michael Neiger's SOG investigations, searches, services, CSI operations, work products, and consults are provided absolutely free of charge to victims, their families and advocates, and police departments. Notice: Michael Neiger is not currently recruiting volunteer searchers. Michael Neiger occasionally seeks a very-fit, non-smoking volunteer or two to work with him during his special operations group (SOG) investigations and field operations. Because he sometimes works the bush fully equipped and provisioned for long-range operations—at times without support or resupply for up to 10 days—his SOG is considered a heavy one by conventional SAR standards. Since many of his cases are sensitive, criminal investigations, some involving working hand-in-hand with local-, county-, and state-level law enforcement agencies, or perhaps federal-level ones such as the FBI, ATF, and DHS, volunteers must be discrete and have spotless criminal histories. To volunteer, candidates must be hard-core, dyed-in-the-wool bushmen and bushwomen, ones who thrive in remote, inhospitable wilderness. They must be at their best with map-and-compass in-hand, living out of a rucksack, panier, sledge, or canoe for days—sometimes up to a week or two—at a time. They must be survivalists by nature, foul-weather-ready, and fully-equipped for off-trail travel, whether in the stifling heat and humidity of a never-ending swamp in the middle of summer, or the minus 40 degree below Fahrenheit standing temperatures (not windchill) of a wind-swept ice sheet on the Arctic Ocean's Lower Hudson Bay. They must be very experienced, with lots of time trekking and bivouacking off trail though challenging bush under a wide range of wilderness conditions. 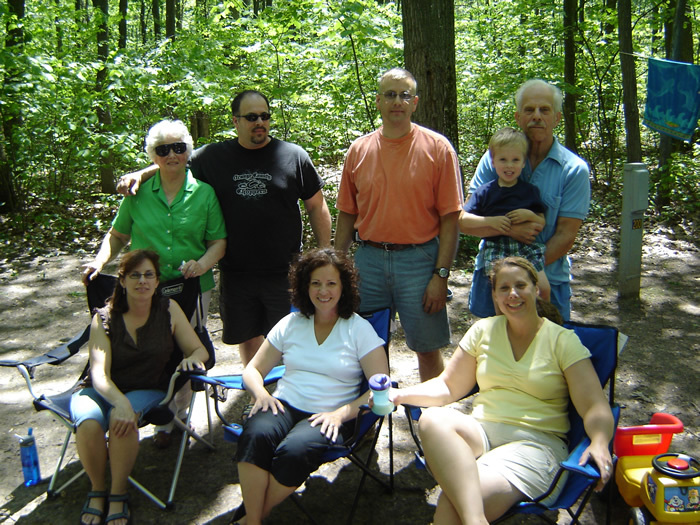 To learn more about volunteering with Michael Neiger, click here. a.k.a. Seneca the Younger, 4 B.C. - 65 A.D.
International Homicide Investigators Association (IHIA). 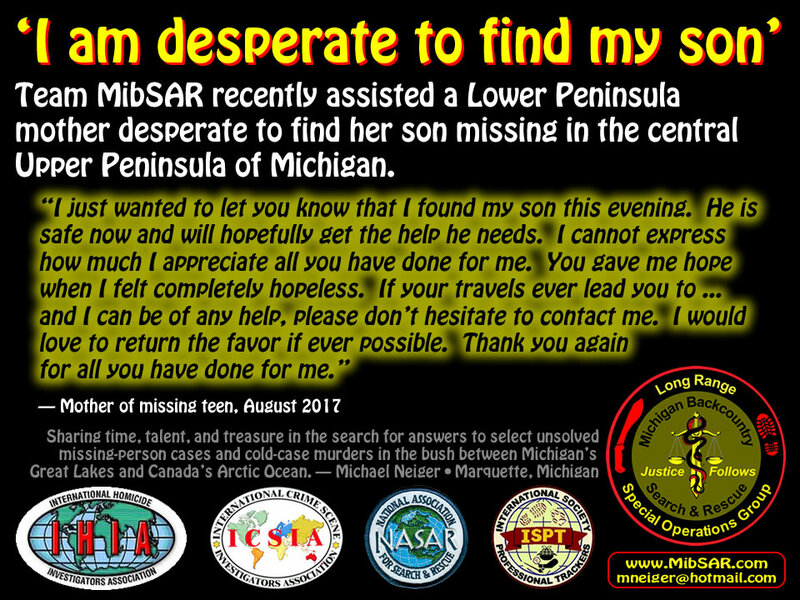 MibSAR was founded by Michael Neiger in 2008, shortly after an articleheadlined "Search for missing man suspended"appeared in the July 19, 2008 issue of the Mining Journal (Marquette, Michigan). Buried deep inside the Upper Peninsula's largest daily paper, the short, 5 paragraph news briefing immediately caught Michael's attention. 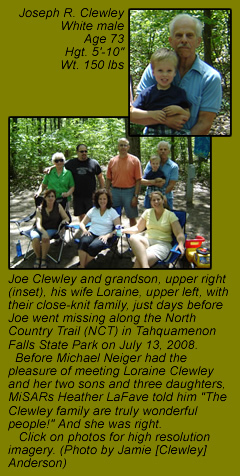 The Mining Journal reported the manJoe Clewleyhad gone missing "in a remote area of Whitefish Township," apparently along a section of the North Country Trail (NCT) located in Tahquamenon Falls State Park, just south of Paradise, Michigan. As a recently-retired Det./Sgt. 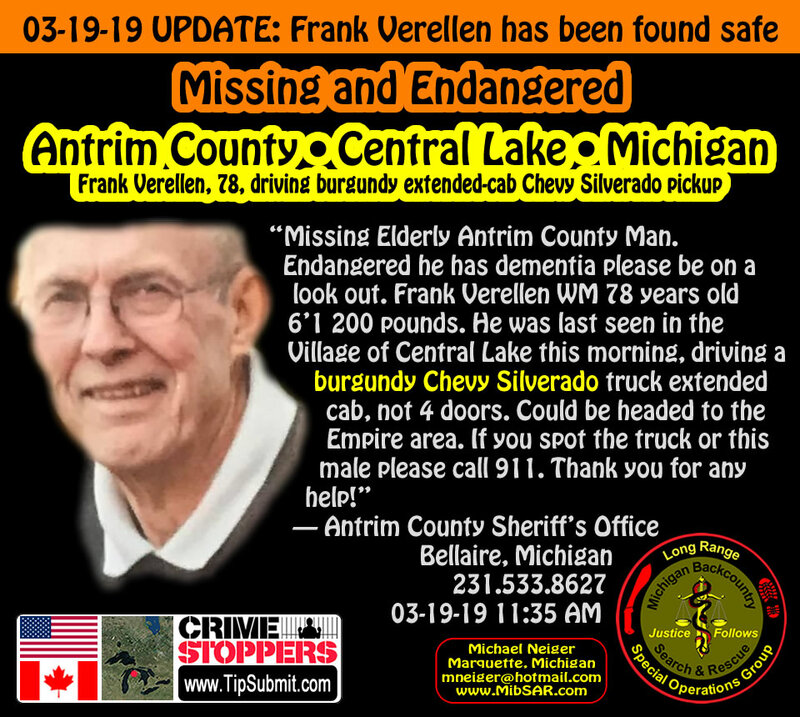 with the Michigan State Police; decades-long, off-trail Canadian wilderness guide; solo expeditioner; and a member of the North Country Trail Association (NCTA), he wondered if he could be of any assistance to the Sheriff's Office and the Clewley Family. 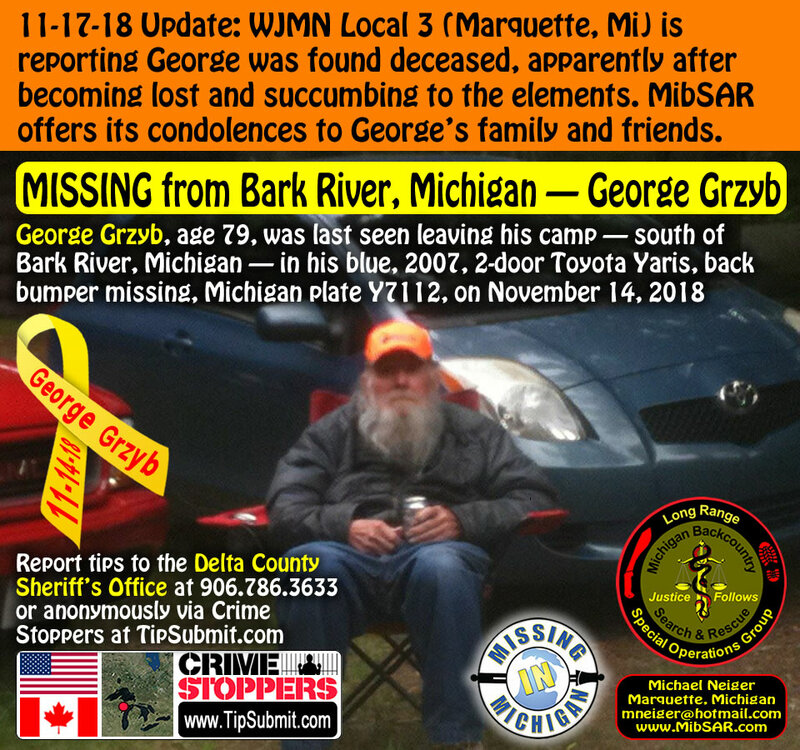 Figuring the Chippewa County Sheriff's Office SAR resources must be stretched to the limit, and the Clewley Family must be going through a living hell, he contacted the Undersheriff of Chippewa County with an offer of assistance. After learning both the Sheriff's Office and the Clewley Family would "most certainly welcome your assistance," Michael packed his rucksack with foul-weather gear and 5 days worth of rations; called his partner Chris Ozminski to alert him to the SAR mission at hand; and began what would be a years-long SAR effort in the remote, eastern reaches of Tahquamenon Falls State Park. Thank you again for all your efforts. 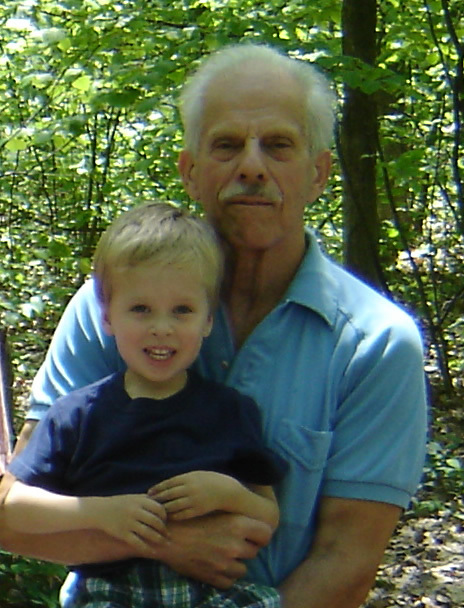 I don't know what good deed gave us the blessing of having you [Michael Neiger] in our lives at this particular moment in time; but I'm forever grateful that we have had your unwavering support, expertise and commitment towards Dad's search. As you can imagine, being in Alabama has distanced me from the search efforts...Your communications are a lifeline for all of us. Thank you again Michael; at the end of this journey I hope we can somehow return this gift to you. 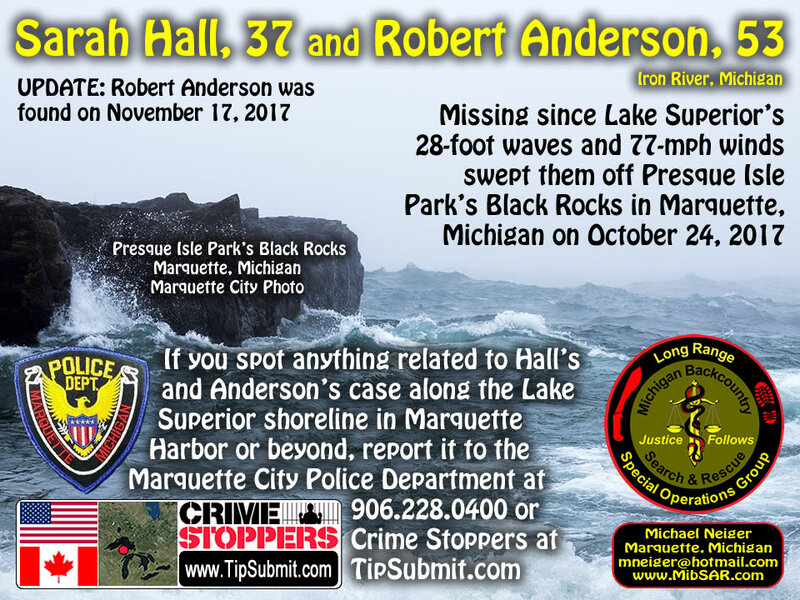 Thank you for [your] continued diligence in the quest to find my Dad. 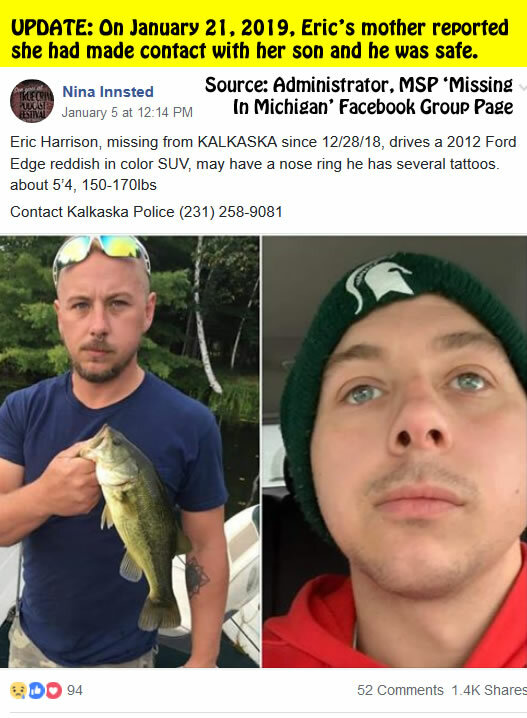 It makes it easier to continue to push through to the next available time for searching when I know that you guys are out there covering the most likely places that he could be. 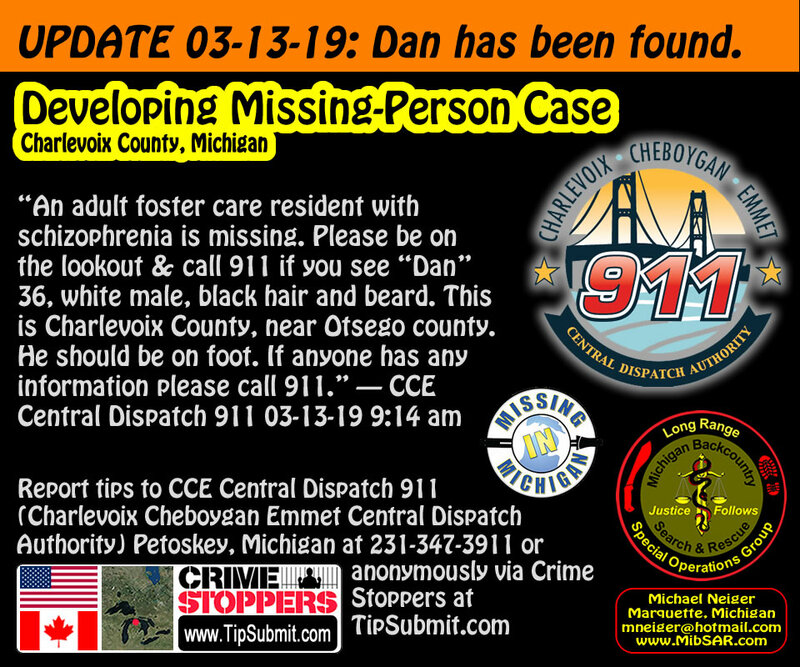 My family can not begin to thank you enough, we are blessed to have such good people as you [Michael Neiger] & Chris [Ozminski] helping to locate him. I would like to add my continued thanks to Mike [Neiger] and Chris [Ozminski] for the undying efforts that you have displayed. Thank you for the website and the searches, it has been a comfort when we aren't able to be there. 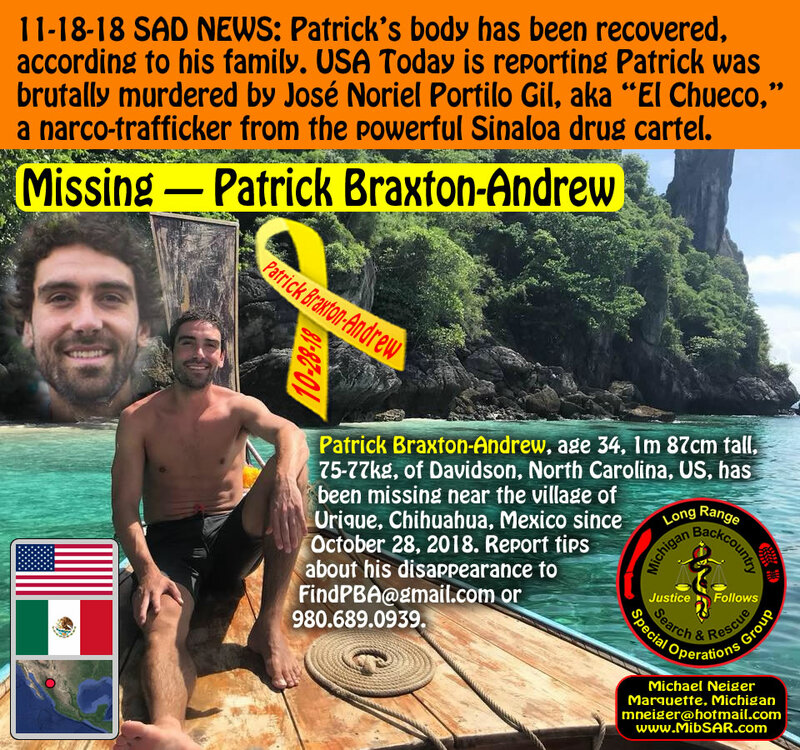 I hope that we are able to locate my father soon to put this tragedy to rest. I also would like to thank everyone who has responded to the thread [blog], I don't feel so alone with your responses. Anyway, thanks again for the help and the reassurance that there is still hope, through any little clue, that we might find my dad. Special thanks must go out to Mike Neiger and Chris Ozminski. They have dedicated most of their summer searching diligently in the search area. 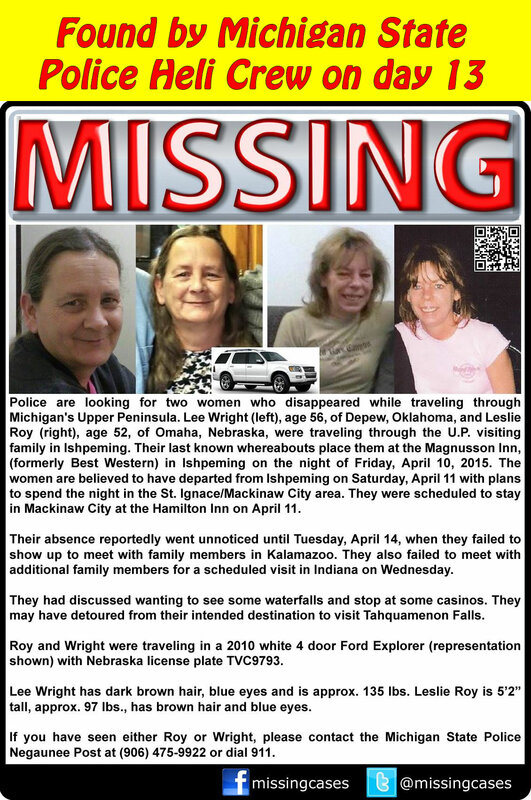 A personal thanks to them is needed as their searching came up with some very pertinent/hard-to-find evidence that has led this investigation in a certain direction. Mr. Neiger is a survivalist with an extensive Law Enforcement background. His knowledge in the preservation of evidence and crime lab expertise has been a great help in the field. 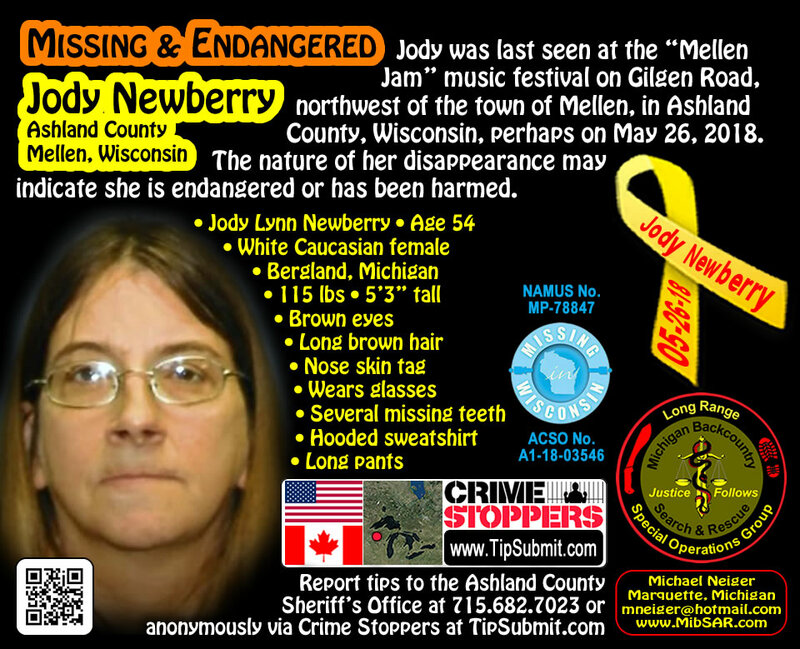 Since the Joseph Clewley investigation is currently an open and active police investigation, the Sheriff's Office has requested that no additional information be released about the case at this time. MibSAR continues to search for any sign of Joe in the hope that one day, hopefully soon, they may be able to reunite this beloved man with his bereaved family. 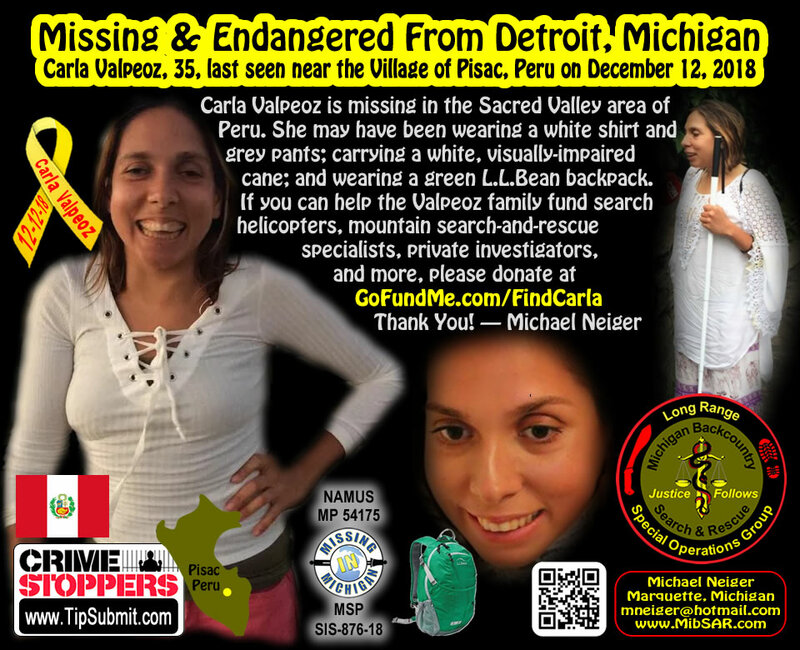 Thank you again for the time Chris [Ozminski] and you [Michael Neiger] have dedicated to finding my dad and helping my family....I know that my family and I look at you guys as more than dedicated searchers....[you're] friends. 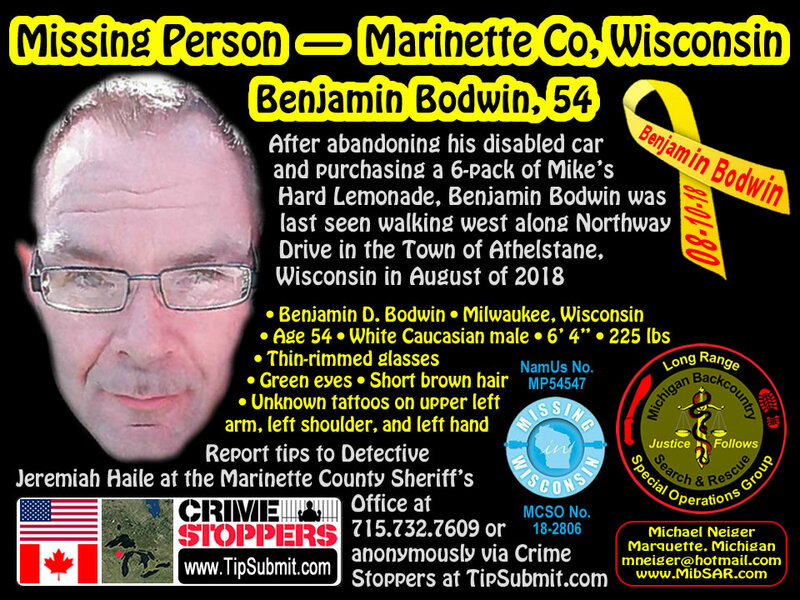 To learn more about this baffling, protracted case, visit Joe's missing-person Web site, which is maintained courtesy of MibSAR. ...but we make a life by what we give. As part of his community outreach program, Michael Neige does archaeological- and historic-site mapping, and artifact-scatter documentation, for governmental units, including Michigan's Office of the State Archaeologist. He also also periodically brushes out and removes deadfalls, debris, and other hazards from the Noquemanon Trail Network's South Trail singletracks in Marquette, Michigan. Through his Extreme Maps for Extreme Races initiative, Michael Neiger provides 1:24,000-scale racecourse cartographycourse maps and elevation profilesfor race directors coordinating long-distance, muscle-powered, endurance events in the Midwest. Michael Neiger would like to thank his many generous, civic-minded partners for supporting his efforts at reuniting the missing with their loved ones. The information contained on this Web page and this Web site is provided solely for information, illustrative, and discussion purposes. Although the author has made a sincere effort to ensure the accuracy and reliability of the information presented on this Web page and this Web site, no warranty is expressed or implied. The author assumes no responsibility or liability for any injuries, damages, losses, or other consequences that may result from the use of the information contained on this Web page and this Web site. As with any human endeavor, omissions, inaccuracies, and errors will occur on this Web page and this Web site and the author makes no representations or warranties with respect to the accuracy or completeness of the information presented or that the information presented will produce any particular result or be suitable for any particular situation, person, organization, or other entity. While corrections and revisions may or may not be made from time to time, any changes made to this Web page and this Web site are made without obligation to notify any person, organization, or other entity of any such changes. The activities associated with the information contained on this Web page and this Web site are by their very nature inherently dangerous and the information presented can not take the place of good personal judgment, sound decision-making, professional training, proper equipage, adequate physical fitness, and expert guidance by trained, experienced, certified, licensed, practicing professionals. No part of this Web page or this Web site protected by copyright law may be reproduced, transmitted, or used in any formincluding graphic, electronic, Web, mechanical or other foror by any meansincluding photocopying, recording, taping, Internet distribution, information storage retrieval system, or by other meansfor any purpose, except by a reviewer, who may quote brief passages, without the prior, express, written permission of the author. stay awake and do them. Marcus T. Cicero, 106-43 B.C. are the roads of genius.